All guests accessing a cabana must have a paid admission to The H2O. Our 25 cabanas are popular and are available to rent in advance online, or on a first-come, first serve basis upon arrival at the park. Cabana reservations are non-refundable unless the Park is closed for the entire day due to rain or wind. You may change your reservation date up to 48 hours prior to your initial reservation date. 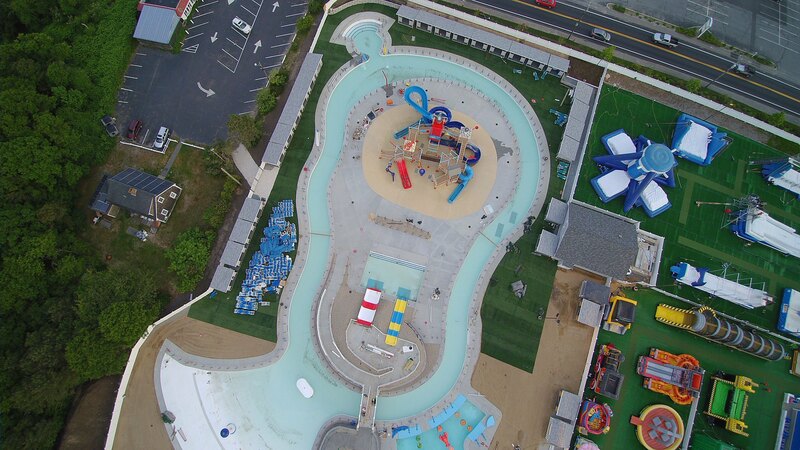 Call 508-771-6060, press 1 for the Inflatable Park and 4 for general info to request a new date. Again, any change in date must be made two days before your initial check-in. Refunds will not be provided for any reason other than weather-related closings. We do not allow any outside food and drink in the Cape Cod Inflatable Park. Guests who would like to bring their own food/drink may enjoy it just outside the park entrance using the tables and umbrellas we provide there. Guests can bring in an empty water bottle to fill up at our water bubbler inside the park. Cabana rentals DO NOT include park admission which must be purchased separately upon arrival at the park. All guests using the cabana will need a paid admission to The H2O as they are located in that park. At least one guest for the reserved cabana must check-in at the Park by 1:00pm on the reservation date. The Park reserves the right to rent the cabana to another group if no guest checks in by 1:00pm. If you expect to arrive after 1:00pm, please contact the Park in advance. Please note that while park passes are required to access your cabana, we DO NOT offer passes online at this time. All park passes must be purchased when you arrive at the park.